If you are responsible for driving innovation in your business, what kind of practical approaches or models are currently available? What are the strengths and weaknesses of each approach? What are they most appropriate for? A lot has been written about innovation strategy and the like. What interests us here is a more hands-on question, focused on creating a neutral, data-driven overview of the main existing solutions that are currently available. We sometimes use the metaphor of an ‘innovation smorgasboard’: if you are looking to make innovation happen, there is this whole buffet in front of you, full of different options for getting the job done, from incubators to traditional R&D to corporate venturing. Each approach has strengths and weaknesses – and some may be more effective than others. With the project, we want to create an overview of the main options that can help people make better decisions about how to make innovation and growth happen. What are the approaches? 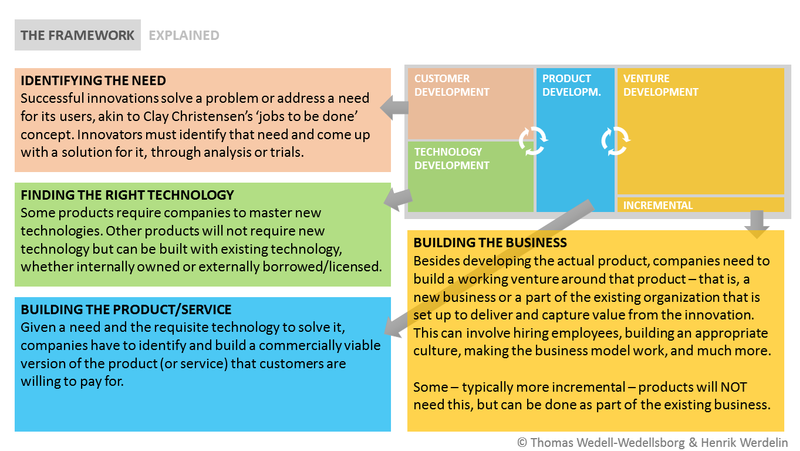 The figure shows how we have currently classified the different ‘types’ of innovation approaches we want to look into. Are these the right approaches? What are we missing? Data. What kind of data or research is there on each of these approaches and their effectiveness/pros and cons? Cases. We are looking for evidence-based case studies to illustrate the pros and cons of the different approaches. If you want a copy of the report when it comes out, send me an email on thomas.wedell@gmail.com. (We won’t use it to spam you). The underlying logic of the model above is based on the recognition that successful innovation has different components, from need identification to building the organization that can deliver the product/service, and that the available solutions address different parts of this. The logic is shown below (click for full size).